While the ESP8266 started out as an inexpensive, reliable way to get WiFi capability on essentially anything (and paving the way for a plethora of Internet of Things projects), it was quickly hacked to become a fully programmable development board that can stand on its own. To that end, [Ben] has recognized its capability to run a very minimalistic NTP clock. The standard C++/Arduino environment is available, so he didn’t have to learn any new skills. The parts list is stripped down as well: besides the ESP8266, there’s little more than the four-part seven-segment display. There’s even an Arudino library for these chips that [Ben] made great use of. From there, it’s just a matter of wiring it all up and syncing it with an NTP server. While it’s not the most involved hack ever, it’s good to be reminded that these chips are cheap and readily available for literally anything that you could imagine. If you haven’t started yet, there’s no reason not to. You can use them to control something like an irrigation system, or if you’re even more adventurous, they can run a 3D printer, too. Thanks [Itay] for the tip! Is developing on an Arduino too slow? Are Phidgets too expensive? When might you use one or the other? Hackaday regular [Ken] breaks down what he learned from three experimental time trials. The main development differences between Arduino and Phidgets are a mix of flavor preferences and some hard facts. The Arduino is open source, Phidgets are proprietary. Arduino requires a mix of hard- and software where Phidgets only needs (and only allows) a connection to a full computer but enables high level languages – it is expected to get the job done sooner and easier. And finally, Arduinos are cheap, Phidgets are 3-5x the cost. The three time trials were common tasks: 1. Blink an LED. 2. Use a pot to turn a servo. 3. Build a pedometer. For [Ken], the Phidgets won in each of the three experiments, but not significantly: 37%, 45%, and 25% respectively. The difference is only minutes. Even considering time value, for most hackers it is not worth the cost. In context, the advantages of a mildly more rapid development on the simplest projects are wasted away by needing to rebuild a permanent solution. Chained to a PC, Phidgets are only useful for temporary or fixed projects. For many of our readers that puts them dead in the water. Arduinos may technically be dev kits but are cheap enough to be disposed of in the project as the permanent solution – probably the norm for most of us. [Ken] points out that for the software crowd that abhor electronics, Phidgets plays to their preferences. Phidgets clips together their pricey peripherals and the rest is all done in code using familiar modern languages and libraries. We wonder just how large this group could still be; Phidgets might have been an interesting kit years ago when the gulf between disciplines was broader but the trend these days is towards everyone knowing a little about everything. Hackaday readers probably represent that trend more than most, but let us know if that seems off. [Ken]’s article has much more and much better detailed explanations of the experiments and the tradeoffs between the platforms. If you enjoy watching parallel engineering, see the time-lapse video below for a split screen of the time trials. Notice how so many maker projects require open-source hardware like Arduino and Raspberry Pi to function? Intel has, and the company is leaping into bed with the former to produce the Galileo development board. 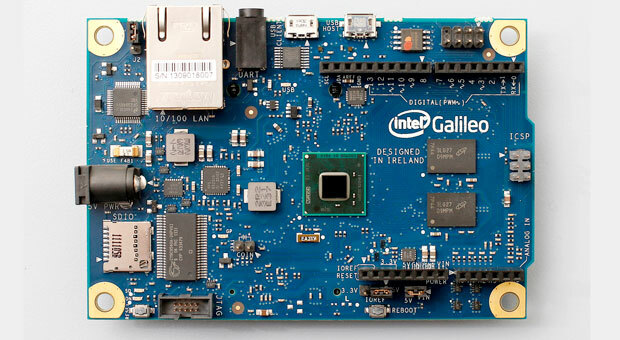 Galileo is the first product packing Intel's Quark X1000 system-on-chip, Santa Clara's (designed in Ireland, trivia fans) new low-power gear for wearables and "internet of things" devices. Don't imagine, however, that Intel is abandoning its X86 roots, as Quark's beating heart is a single-thread Pentium-based 400MHz CPU. As part of the new project, Intel will be handing out 50,000 of the boards to 1,000 universities over the next 18 months -- a move which we're sure will make Eben Upton and Co. delighted and nervous at the same time. I made this blog to tell you all about my latest project, after my Robotic Arm project has died out a little. This little thing will be my first actual "robot". The whole idea behind it is that I will have a platform which will be easy to further develop, and thus be awesome to learn new stuff.